It’s a whole new way to garden. Grow a living wall easily with Florafelt Vertical Garden Planters. Our handmade planters are designed to use the micro fibers in PET felt so that all the plants are watered equally. The felt is made from recycled plastic water bottles, a non-toxic fiber that is indestructible and tough. 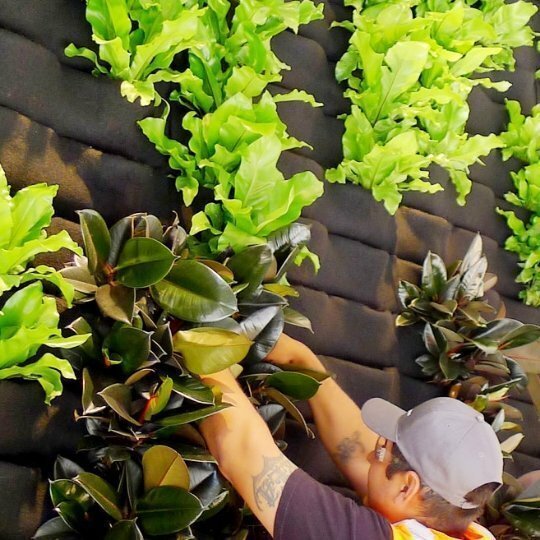 This amazing material provides a safe growing medium that is pH neutral and non-reactive, so you can garden organically right on your wall. It’s even safe for vegetables and herbs! Roots grow right into the felt, which comes alive thanks to the microbiology in the soil. Florafelt planters come with our custom Root-Wrapping system. 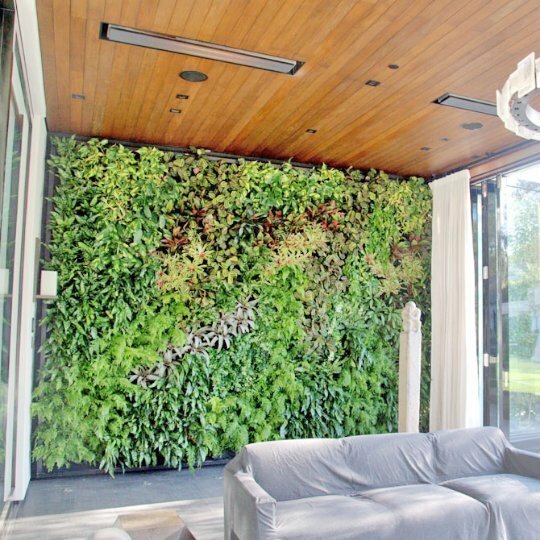 It lets you change and rearrange your living wall at will, while maintaining the integrity of every plant in its own soil. We created the pockets so that they would accommodate a handful of soil. The soil balances pH and introduces microbiology to let nature do its work and bring the felt alive. And it is crucial to use synthetic materials so the support system doesn’t dissolve. What’s Wrong With Small Compartments or Planter Boxes? Plastic compartments and planter boxes restrict root growth and create the same problem as planters – root binding. Plastic also doesn’t allow breathability, and our felt pockets eliminate the many difficulties with root rot issues. Additionally, the soil is tightly held in place by the felt wraps within the pockets, keeping the entire system extremely tidy. And the pleats direct the water inward, making it drip-free. Not all plastics are the same. PET plastic is a non-reactive, non-toxic plastic which is why it is used for anything from milk jugs to water bottles. Trace amounts of toxins are known to emerge from PET, but soil microbes break down those complex molecules long before they reach plant roots. We chose synthetic nylon felt fibers for our Florafelt, turning unused water bottles into something useful. 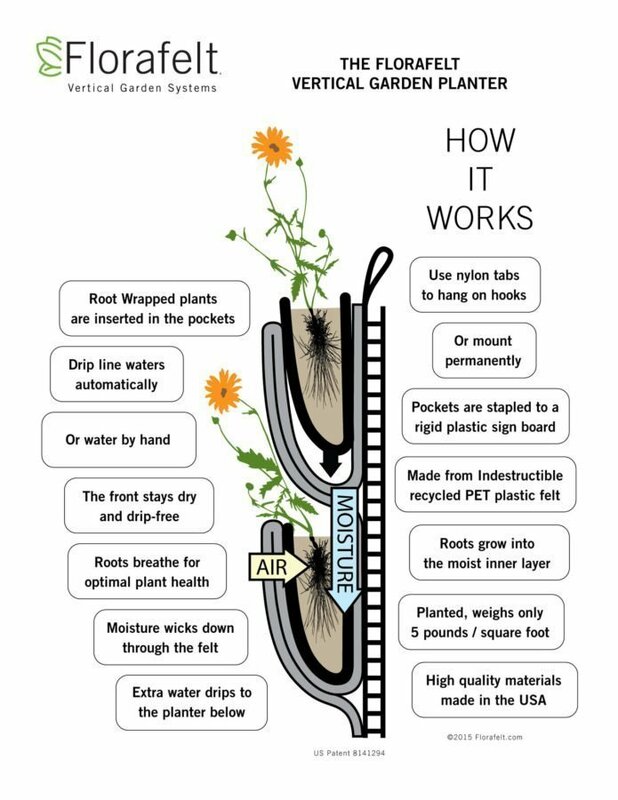 Additionally, plants grown in this material absorb carbon from the atmosphere, making Florafelt a ‘carbon absorbing’ product. 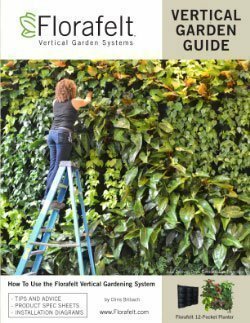 Our Florafelt vertical garden guide gives you an overview of how to design and build your own living wall. Includes: specs, installation types from drain-away to custom recirculating systems and how to best locate your installation, choose plants and maintain your system. 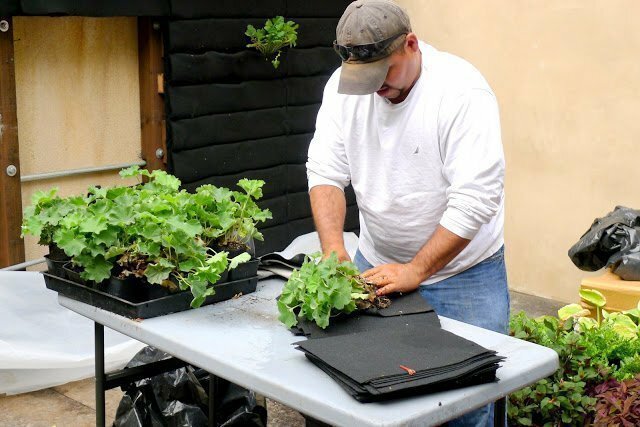 Check out our Guide Page for more detailed information about how to install a perfect vertical garden.